Kobo Arc is Kobo 2nd attempt at tablet PC. Much like Amazon Kindle Fire, it have a custom skin over Android OS powering the tablet, called Tapestries. It’s called Tapestries, and it breaks down your content on the device into categories like books, music and social and puts it in folder-like shortcuts on your screen. When you activate a Tapestry folder, it takes you to another screen that is immediately filled with your books, video, or your social networks. It sounds simple, but it’s such an interesting way to get at your content. One of the most frustrating things for new Android users is where all their stuff is being stored on the device. Is it in Gallery? File Manager? Can I search for it? With Tapestries, those questions are rendered moot. 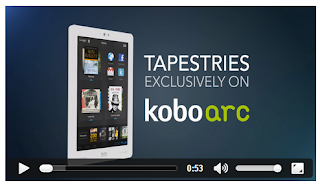 Considering that Kobo is geared towards ebook, this is no surprise. As for the specs, it comes with dual core 1.5GHz processor, 1GB of RAM and Android 4.0 ICS powering the device. The screen is 7-inch, 1280 x 800, IPS display. Similar to the screen powering Google Nexus 7 and Amazon Kindle Fire HD. The price ? Kobo Arc 16GB is available for $199, while the 32GB at $249 and 64GB at $299. Very friendly price for the specs. 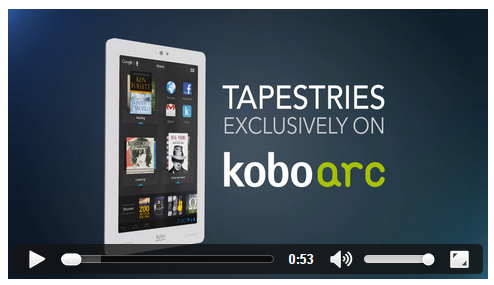 If you are using your tablet for e-book reading, do consider Kobo Arc. For further review, you may want to check PC Magazine review of Kobo Arc.